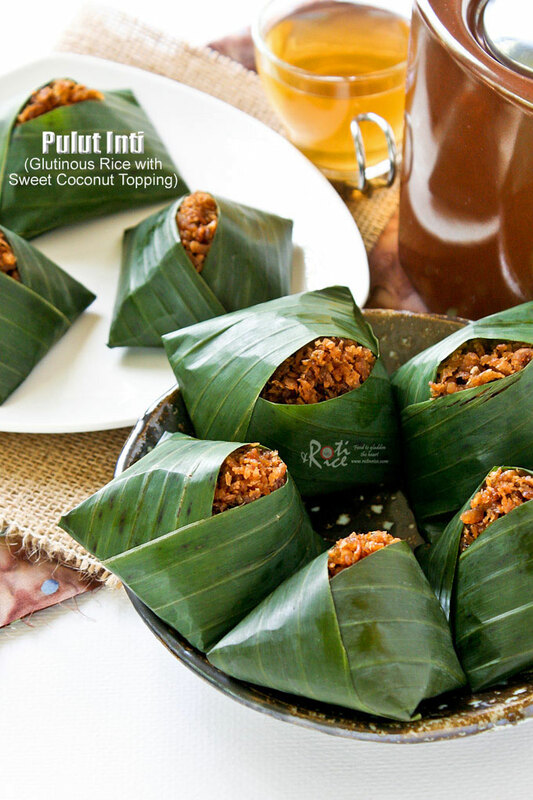 Pulut Inti is a traditional Malaysian dessert of steamed glutinous rice with a sweet coconut topping. They are usually wrapped in banana leaves. Like Sweet Corn Pudding, Pulut Inti is yet another childhood favorite easily available at the kuih (dessert) stands back when I was a kid. 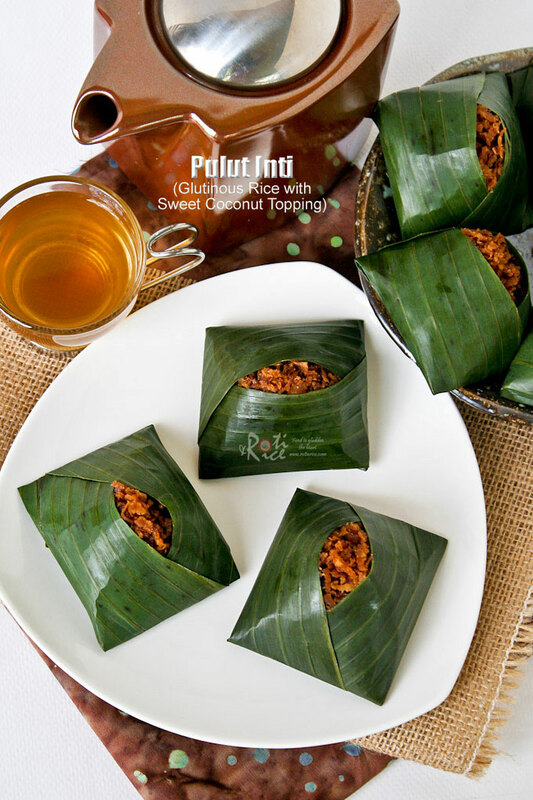 It is a simple dessert wrapped in banana leaf. Inside the small pyramid shaped package is a mound of steamed glutinous rice topped with inti, a sweet coconut filling. The best Pulut Inti comes with a generous heaping of the sweet inti as the rice is merely to complement it. It is hard to determine the origin of this dessert. Many of the kuihs native to the Malay culture have been adopted and improvised by the Nyonyas. In this particular dessert, the Malays usually leave the steamed glutinous rice white. The Nyonyas like to streak the glutinous rice blue with bunga telang (blue pea flower), a natural food dye. Glutinous rice feature in many Nyonya and Malay desserts. Most are sweet like serimuka (glutinous rice with custard topping) and pulut tai tai (glutinous rice cake with coconut egg custard). 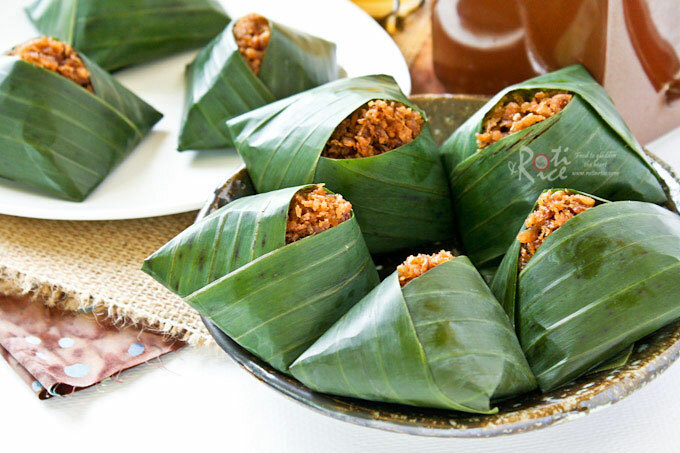 A savory one that comes to mind is rempah udang (glutinous rice with spicy shrimp filling). Some of these desserts involve many complicated steps and techniques which can be tedious. 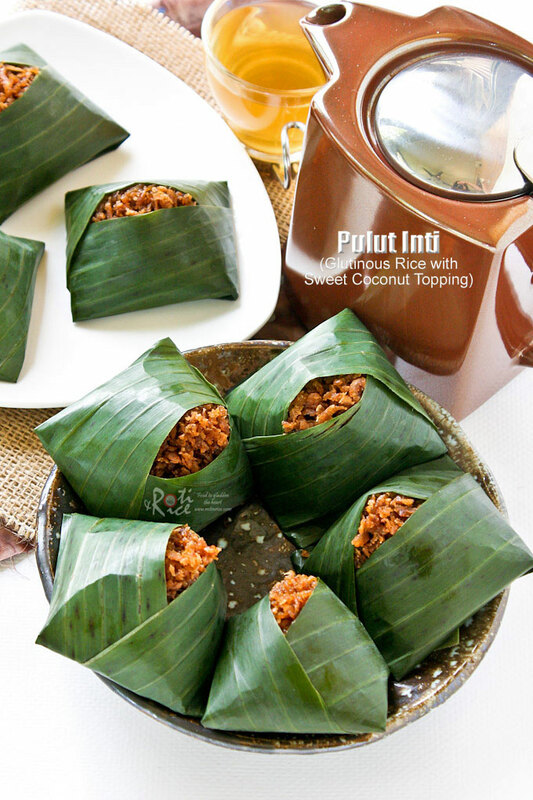 Pulut inti is an exception as it is fairly easy to prepare. Frozen banana leaves can be purchased at the Asian or Indian grocery stores. They need to be thoroughly washed, wiped dry, and cut down to size before use. I recently bought a packet for my Nasi Lemak Bungkus and only used two large leaves. I used another two more leaves for this dessert. They do make a lovely presentation. Please do not let this step deter you as Pulut Inti may also be served in a small dish. I do not have bunga telang and so I left the glutinous rice plain. Bunga telang imparts a very pleasing purplish blue color unlike artificial blue food coloring. Pulut inti is usually eaten at room temperature but it is also delicious served slightly warm. It may be reheated in the microwave. Wash and drain glutinous rice 4 to 5 times until water runs clear. Cover glutinous rice with water and allow it to soak overnight or at least 4 hours. Line a steaming rack with banana leaf. Make sure it is large enough to cover the base and also slightly up the sides of rack. Place pandan leaves on top. Drain glutinous rice. Mix in salt and transfer to steaming rack. Pour ¾ cup coconut milk onto rice. Cover and steam over medium heat for 20 minutes. Remove lid and fluff glutinous rice with fork. Sprinkle the 2 remaining tablespoons of coconut milk onto rice. Cover and steam for another 5 minutes. Combine water, gula melaka, and pandan leaf in a small pan over medium heat. When gula melaka has melted, add grated coconut and butter. Cook for about 4 to 5 minutes. Stir in cornstarch mixture and cook for another minute. Remove pandan leaf and allow it to cool. 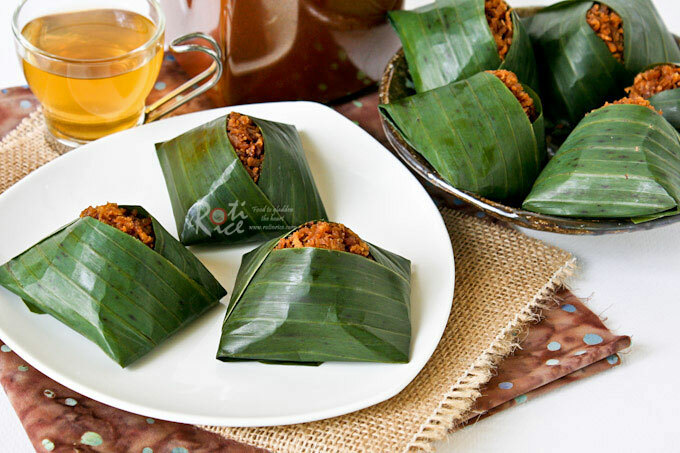 When glutinous rice is cool enough to handle, pile about a quarter cup cooked rice onto a piece of prepared banana leaf. Top with a tablespoon of sweet coconut topping. Bring the long edges of banana leaf to meet in the center with one edge overlapping slightly on one end. Criss-cross the flaps in the center by placing bottom flap on the top on the opposite end. Fold both ends under to form a pyramid shape package. 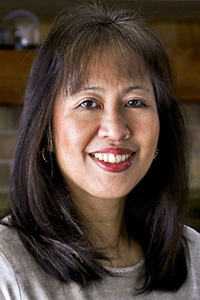 I am linking this to Flavours of Malaysia hosted by Simply.Food. Funny I was going to make a tapioca/coconut dessert wrapped in banana leaves (from my backyard) but I wasn’t sure how to fold the packages. So happy to see this! I still can’t find pandan leaves, even frozen in the Asian market. I want to plant one so I will have it any time I want it. It will go next to my bananas! 🙂 Thanks for sharing the wonderful food from your childhood! I only have two more weeks of school, then summer break! I didn’t get to work summer school this year. Hopfully I’ll get on the computer more! 🙂 Have a great weekend Biren! Pandan should grow in Florida but I am not sure if you can find the plant. Most of the pandan sold here come frozen from Thailand without the roots. Yes, my kitchen did smell very good especially when cooking the inti. The savory version you are referring to is probably the rempah udang where the cooked glutinous rice has a spicy shrimp filling. The entire things is wrapped in banana leave and grilled to give it a smoky flavor. I made it not too long ago and it was delicious. Thanks Angie! Have a wonderful weekend. Hi Biren 🙂 I always thought pulut inti was like little baby nasi lemaks when I was a girl LOL Your little bundles look so adorable I want to break out in baby talk! These were my absolute favourite kueh when I was in school, and now I realise how talented the canteen kueh aunty was! Her stall display case was like a gorgeous painting – so many colours and shapes and she made that section of the canteen smell perpetually of pandan and coconut! No wonder we all swarmed to her stall every recess like bees around their queen! These days I find them a little too sweet to eat more than one of but they are still delightful, especially when the pulut is perfectly cooked and tender right through each grain. Yours looks perfect! Funny, I thought the same too. 😀 These are really cute if I can say so myself. I made sure I had enough glutinous rice for 8 packets so that each person can have 2 packets. Next time I need to double up the recipe. Yes, those were the days. Kuih stalls are not as common these days, especially the good ones. A lot of the kuihs are artificially colored and look too green or too blue. They don’t taste as good too. The younger generation is not interested to make these kuihs as some of them are just too time consuming to make. Good thing many food blogs now have the recipe so it won’t be lost forever. Oh how lovely they look! It looks easy to me, I have to try it! Hi Meena! Thanks for visiting and leaving a comment. This truly was a childhood snack. It seems like quite a few of us share the same experience. 🙂 Kids love pulut inti because they are sweet and easy to eat. My boys are big kids now, but they still enjoyed them. I shouldn’t have taken so long make these. Hmmm….a perfect street food! My favourite one is eating it with kaya jam. Slurpppp…. Yes, there are pandan extracts but the taste is not the same. Try an Asian grocery store. You should be able to find pandan in the frozen section. It is hard to describe but the fragrance is that of vanilla and jasmine combined with sweet floral notes. When you cook or bake with pandan, your entire kitchen smells so wonderful. I do hope you get a chance to try it. You will not be disappointed. Thanks for the invite! I will check it out. This is definitely something I have never seen before! It’s beautiful and the flavors some wonderful, but then I am a huge fan of sweet glutenous rice! Love the presentation! Thanks MJ! Sweet glutinous rice is delicious. We also use it in savory dishes. Biren, I have eaten this in Hong Kong and this tastes divine! I love the way you wrapped the rice: so neat! Stunning photographs. I am glad to hear you got to try it. It’s simple but very tasty. Thanks for your lovely comment. Looks nice and neatly wrapped up. Can do with a packet for breakfast! Must be delicious! I find glutinous rice has something very comforting to it! These look spectacular! Really, really attractive. I’ve never worked with banana leaves, but it looks like fun – and your instructions/photos are very thorough. And I love coconut, so I know I’ll like the topping. Great recipe – thanks. These are amazing Biren, and so pretty not to mention sinmply delicious! Thankyou for sending this recipe to flavours of Malaysia. I love the presentation and links.please can you link the event to this post? When I saw your pictures – I couldn’t imagine how you would cook them or wrap them but you explained everything so clearly. They must taste so yummy. This is one of my husband favourite snacks whenever he drop by at roti canai stall (restaurant) for his breakfast. Thanks for the recipe. Will try to make it for him. It will last a day or two in the fridge but you would want to warm it up before serving or the rice will be hard. Hi Linda, love all the recipes you posted. Thank you. It is difficult to get freshly grated coconut in Australia. How can I make the sweet coconut filling using desiccated coconut. Try rehydrating the dessicated coconut with some milk before using it.